Why do we hide our face on Purim? Why do we hide our f aces on Purim? 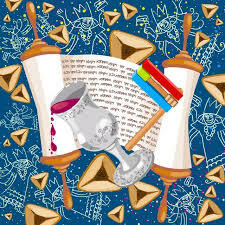 Providence has arranged that Purim is 30 days before the 14th of Nissan, the day the Torah describes as the beginning of Pesach, the day we clear out all chomets. Halochoh states that 30 days before a festival, we start learning about that festival. Thus, the Chasidic Masters understood that the light of the festival starts 30 days beforehand. The rabbis teach that chomets signifies the yetser hora, our 'shadow' side. The yetser hora is symbolised by Amolek. On a certain level, removing the chomets before Pesach is connected with the removal of evil before the revelation of G-d's Glory at the time of Moshiach. We give food presents and alms to whoever asks (giving kindnesses) and we hear the Megiloh. The Megiloh (according to the kabbalah) is the element of Torah, which corresponds to mercifulness. What about the third trait - modest and shamefaced? This is a reason why we dress up, putting on masks, to hide our face - the opposite of brazen-faced. By engaging in these 3 traits, to be merciful, shame-faced and giving kindness, we eradicate any of the other 3 traits we may have: cruelty [to anything or anyone except wicked people], brazenness and stinginess. Through this, we wipe out Amolek.